Thermaltake is a company I've long associated with just fans. I remember the unique "Orb" CPU coolers as if it was just yesterday. 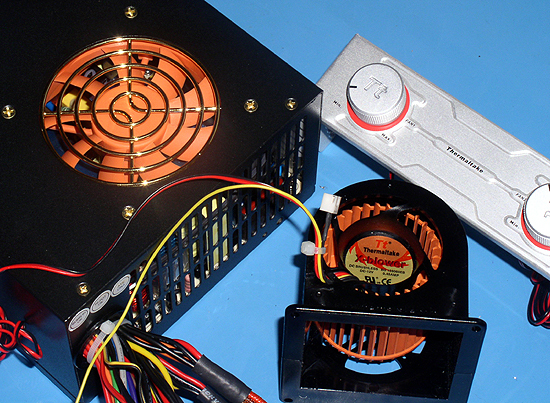 Recently, Thermaltake has taken the direction of designing and selling cases and, even more recently, power supplies. The "Butterfly" series is Thermaltake's line of power supplies featuring an extra case fan, a 5 1/4 bay mountable fan controller that controls both the "bonus" fan and PSU fan, a removable "butterfly" logo that exposes a window so one can see the inside of their power supply and 7 color LED illumination. The Butterfly comes in four flavors. Silver or black. Active PFC or no PFC. We're taking a look at the black without power factor control. Inside of the box, we have our power supply, a nice little squirrel cage case fan and a fan controller for a 5.25" bay.